Hope everyone had a nice Thanksgiving! Ours was a little crazy, but greatful for all of the blessings we have received! It's hard to believe that it's almost Christmas time! Trying to finish up Christmas shopping so I can enjoy being with family and kids. We'll be closing sometime the week of Christmas and will reopen after the first of the year. We've updated this list so be sure to check it out! We've got lots of Christmas 8-tracks up for sale as well as some other specials - sale on sensing foil, license frames and free shipping on gift certificates of $25 or more. We want to take the time to wish all of our customers a happy holiday season and thank you for being loyal customers! The feel of Fall is in the air! We've had beautiful weather the last week or so. I understand heavy rain is in the forecast for tomorrow night. I guess that just means that we don't have to run the sprinklers and a lower water bill! We put up a new list today. You can check it out at www.katestrackshack.com. ooking car. Dan periodically looks for them on the Internet. Several months ago, he came across a 1922 Chevy FB Baby Grand touring car on Craig's List. For the price, Dan expected it to be a real heap that had probably come out of a barn. Well, not quite. The previous owner had found it that way! This gentleman did a lot of work on the car. He stopped working on it about 10 years ago and then passed away about 3 years ago. It's been sitting in the garage and his wife wanted it gone. After a lot of hassle and frustration, the car finally arrived Sunday afternoon! Dan has been working on it to get it to start. He is so close! The one really great thing about this car is that the gentleman who owned it, keep a journal of his work on the car. His wife sent us all of his paperwork, pictures, receipts, etc. She also loaded up the car with lots of extra parts and goodies! The first picture is what a 1923 Superior looks like and the other picture is ours (1922 Chevy FB 50 Baby Grand touring car). BTW, we named the car Harold! The list was updated a couple of days ago, but to much going on to put up a post! I've added the picture of our signed 8-track to the front page of the web page. Pretty exciting! We just got back tonight from a car show where we took our '64 Amphicar and our daughter's '76 AMC Pacer. The Pacer just got the windows tinted and some new trim on the sides. It looks great! It still has an 8-track player in it and one of our license plate frames. We're hoping to get our latest acquisition here in about a week and a half. It's a 1922 Chevy Touring Car. Don't think we'll be putting an 8-track player in that one! What a summer it's been for us here! Kids are back in school (college, high school and jr. high). I was able to tag along with Dan to DC and see some our country's famous landmarks. We finished the Cheap Trick 8-tracks, but have more bands wanting to put their latest albums out on 8-track. It's very exciting to see this "dead" media coming back to life!!! 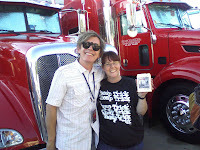 We were able to meet with two of the band members from Cheap Trick and get my picture taken with them and was able to get one of our 8-tracks signed. They also held one of the new tapes up for the audience to see. Hope you're staying cool where you are! I am such a terrible blogger! I need to getter at it and do it more often. I have a friend who blogs almost daily! Where does she find the time to do it!!!! Just letting you know that the list is finally updated on our website!!! I promise (I know I said that last time!) that I'll try to do better at keeping it updated more often! The exciting news is that we're producing Cheap Trick's newest album - The Latest, on 8-track. 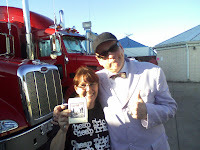 You will have to order directly from their official website - www.cheaptrick.com. I think my favorite song on the album is Smile. Let me know what yours is. We were on vacation when Cheap Trick, one of the 8-tracks we made and one of our players we sold CT showed up on the Steven Colbert show. We didn't get to see the show until Tuesday, but it was awesome!!!! We may be having Night Line coming out to do an interview with us soon. We'll keep you posted. Updated List and Cool News! It's been awhile! So much going on around here! Kids are now out of school and we had one to graduate high school last weekend! If your band is interested in having your next album put out on 8-track send us an email and let's talk! We added a couple of new pages with tapes to the list so check it out too! www.katestrackshack.com. Hope you're having a good beginning of summer! Stay cool if you can!!!! Hope you're having a great day and getting ready for a better weekend! It's lightly raining and a bit chilly around here. Just to give you an update - we will be able to give Rob and Donna about $1200 for our sales in January! Thank you to everyone who helped us out! We will keep you posted on how they are doing with the fund raising. Anyone donating over $250 will get an automatic tax receipt. The list is now updated! We're working on some cool things for the site that I think will be a lot of fun and you'll like. We'll keep you posted on those as they get closer to being unveiled! We wanted to let you know that we've raised nearly $500 so far for Dan's brother Robert. We're hoping to be able to give him much more! We appreciate everyone's help in helping Robert and Donna reach their goal! 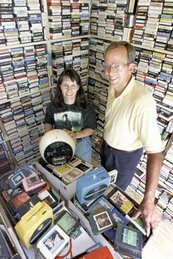 We've updated the list with more tapes. We've also reduced the price on the Beatles tapes. They are now $3, but also will be sold As-Is. They have been tested like the other tapes. If you want to see something really funky, you need to check out Dan's latest project that he's working on! We call it Frankenschmitt! This thing is going to look so cool when he gets it finished. I think Dan should put an 8-track player in it don't you! Thanks again for being such great customers!!!!! It was good to see family that we hadn't seen for a while and to meet those who we hope may be family some time in the near future! We hope everyone had a Merry Christmas and got everything they wanted! We also want to wish everyone a most happy and prosperous New Year for 2009!!!! In our last post, we told you about Dan's brother, Robert and his goal of trying to raise at least $20,000 to have a medial procedure that will hope will allow him to walk again. Therefore, we have decided to donate all of our sales for the month of January to Robert and his wife Donna in hopes that this will get them a little closer to their financial goal. We've tried to add a lot of good tapes to the list this time so take a look! There are a few items on sale this month as well like sensing foil and large cases. Again, Happy New Year to you all!